This new title in the Homework Helpers series will help build a solid mathematical foundation and enable students to gain the confidence they need to continue their education in mathematics. Particular attention is placed on topics that students traditionally struggle with the most. The final chapter in the book covers word problems in detail, and several problem-solving strategies are discussed. 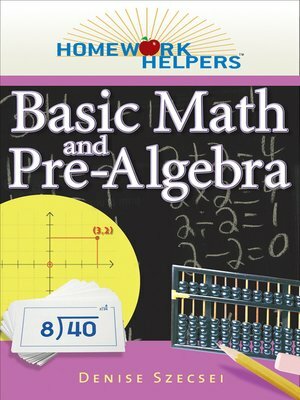 While this book could be used to supplement standard pre-algebra textbooks, it could also be used to refresh your arithmetic and problem-solving skills. The topics are explained in everyday language before the examples are worked. The problems are solved clearly and systematically, with step-by-step instructions provided. Problem-solving skills and good habits, such as checking your answers after every problem, are emphasized. There are practice problems throughout the book, and the answers to all of the practice problems are provided.